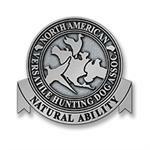 Welcome to the official store of theNorth American Versatile Hunting Dog Association. We offer many products and services for versatile hunting dog owners, trainers and breeders. For more information about NAVHDA, visit our homepage at www.navhda.org. Your dog will thank you for stopping by. U.S. and Canadian orders only please. How do you like our store? Support NAVHDA by shopping here! The North American Versatile Hunting Dog Association, Inc. functions under a non-profit corporate charter and has been granted a charitable status under Paragraph 501(c)(3) of the Internal Revenue Code as an educational and conservation organization. The organization's Federal Identification Number is 95-3402489.